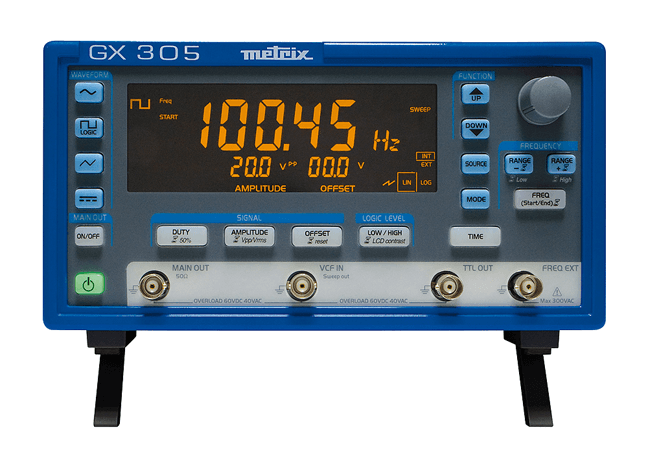 With its DDS (Direct Digital Synthesis) technology, the GX 305 5 MHz function generator offers significantly better accuracy and frequency stability than traditional generators. The GX 305 can be used to generate precise, varied signals: waveforms, sine, triangle, square & LOGIC, TTL output. It covers a frequency range from 0.001 Hz to 5 MHz. In addition, it is equipped with an external frequency meter covering a range from 5 Hz to 100 MHz. This ergonomic instrument includes a large LCD screen (125 x 45 mm) which makes them exceptionally easy to read thanks to the main display with 5 digits 20 mm high. The backlighting is adjustable and the contrast can be accentuated if necessary.